Church of Nativity Mosaics etc. The Church of the Nativity was first built by Constantine and dedicated in 339. After the Samaritan revolt in 529, it was rebuilt by Justinian (r. 527–565). The basic outline of the current church is that of the Justinian Church—with additions and upgrades. 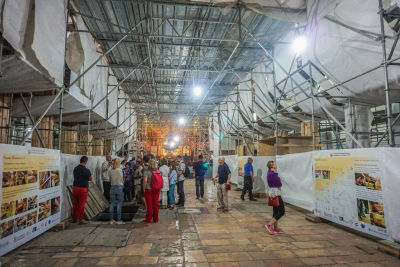 In recent years the Italians and Palestinians have been refurbishing the church (ca. 2013–to-date). This section includes images of the refurbished mosaics, columns, and doors.